Various designs including soccer playing dogs, bumblee bees flying kites and colorful snorkeling fish. Durable acrylic adhesive is skin friendly and absorbent. Non-adherent island pad seals out dirt. Comes in a convenient dispenser box. Not made wtih natural rubber latex. 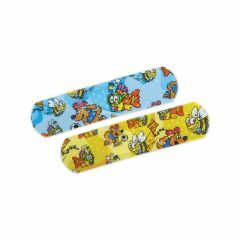 AllegroMedical.com presents The CURAD Medtoons Adhesive Bandages. Various designs including soccer playing dogs, bumblee bees flying kites and colorful snorkeling fish. Durable acrylic adhesive is skin friendly and absorbent. Non-adherent island pad seals out dirt. Comes in a convenient dispenser box. Not made wtih natural rubber latex.